Use TB48KAA to reference this item. Collecting photos, travel from geocache to geocache, visit as many countries and places as can be and maybe return one day. Important: Please send a photo either from the cache you have found the travel bug in, or the near surroundings where the geocache is located (maybe a gorgeous view) or a photo of yourself. I will place the photo at my homepage and describe where my travel bug currently is. Er soll Fotos sammeln, von cache zu cache reisen, so viele Länder und Orte wie möglich besuchen und womöglich eines Tages zurück in seine Heimat kehren. Wichtig: Bitte sende ein Foto entweder vom Geocache in dem Du den Travel Bug gefunden hast, der näheren Umgebung (vielleicht eine schöne Aussicht) oder von Dir selbst. Die Bilder werden auf meiner Homepage veröffentlicht und es wird berichtet wo sich der Travel Bug gerade befindet. Du kannst seine Reise hier auf geocaching.com oder sensorgrafie.de verfolgen. 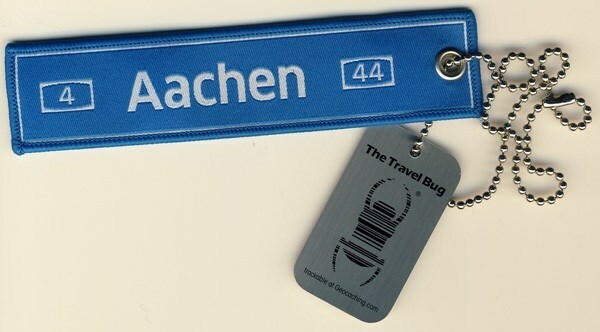 The Blue Aachen Travel Bug started his journey once upon a time in June 2011 in Nova Scotia. Attached is a cloth banner with the name of the most western city in Germany: Aachen (in french it is called Aix-la-Chapelle). The numbers 4 and 44 on the banner are the numbers of the two German motor highways that connects Aachen to some other German cities. Aachen has Germanys oldest coffee roastery. The cathedral - the first monument in Germany to be included in the UNESCO Cultural Heritage list - and the gothic City Hall in which 32 German kings celebrated their coronations still form the heart of Aachen’s old city centre. A lot more historical and rare stories that awaits you to be discovered here in Aachen. Aachen also played a role for the Fortress of Louisbourg on Cape Breton Island, Nova Scotia, Canada, with the Treaty of Aix-la-Chapelle back in 1748. This is why I brought the Travel Bug to Nova Scotia to start his journey. You should visit the tourism website of Aachen to learn more about the city and the place of my birth. Have a lot of fun traveling along with my travel bug and please send me your photo!